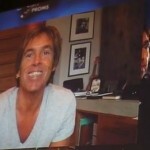 A very short clip of Per Gessle speaking about The Nokia Night of the Proms Roxette’s preperations was posted on YouTube by Kempenactueel on September 10. According to informations posted on Jan Vereecke’s blog this meeting was held in Lotto Arena in Antwerp, Belgium. It comes from some kind of briefing with over 160 Belgium journalists, sponsors and VIP clients. Tickets for German shows are currently at #7 on Eventim.de charts. Thanks to crashroxer @ R2R.